Online Bingo rules are quite simple but there are variations on the game so players have to make sure that they understand these rules. For example in some bingo sites players can win with a diagonal row of numbers and on other sites they can’t. In some cases the rules will change from one game to the next, for example after a regular bingo game, a sliding jackpot game may play in a 75 Ball Bingo room and the best way to learn how to play online bingo is to start playing as mentioned above, as the rules are fairly simple. The objective of all these bingo variations is fairly the same; to try and get all the numbers in the predetermined pattern or line to win the game. There are 4 main variations of Bingo games, namely 90 Ball Bingo, the popular 75 Ball Bingo, 30 Line Bingo also known as Speed Bingo and 5 Lines Bingo which is Swedish Bingo. First players have to get acquainted to the rules of the various bingo variations being played on the bingo site. A card for a 90 Ball Bingo game consist of a grid made up of 9 columns and 3 rows, and each of these rows contains 5 numbers randomly placed and the rest of the cells are blank. This creates more odds for the players and at the same players can purchase more tickets to give them a greater chance of winning. As in any standard online bingo game, numbers are called randomly using a random number generator and then it appears on your screen. 75 Ball Bingo is played using a 5×5 card with the middle cell being blank and called Free. To win a 75 Ball bingo game, players have to cover a particular pattern revealed before the start of the game, it can be in the form of an alphabet, a number or any drawing. 30 Line Bingo is mostly known as Speed Bingo as players attempted to be the fastest one to complete the winning pattern on the card. The card used for 30 Line Bingo is a 3×3 grid consisting of 9 numbers whereas 5 Line Bingo is played on a grid similar to the 75 Ball Bingo except here with no blank cell in the middle. The aim of Swedish Bingo (5 Line Bingo) is to cover any horizontal, vertical, or diagonal line to win the 1 line, then cover any 2, 3, 4 and 5 horizontal or vertical lines to win line 2, 3, 4 and 5 respectively. When you access a bingo room from a bingo lobby, you will get to choose the number of bingo cards you want to be in play by clicking on them or by using the auto-select option that will allow you to purchase more than one bingo card in a go in the form of strips, which usually consist of 12 cards for a strip, and you can select up to 4 strips. 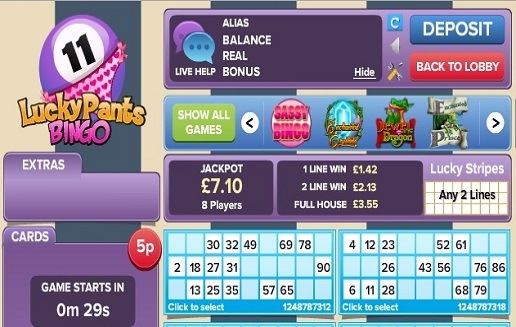 There is also an auto-buy option available on most bingo sites that will allow you to purchase bingo cards for a particular number of games without the need for you to intervene in between, giving you the time to put your feet up and relax. You will note that the price of bingo cards varies in each room and while it may have a fixed price in some rooms, in others it may change at the end of a game. Once you have purchased your cards, you will only require to wait for the game to start automatically. There is nothing much you need to do once the game has started as there is an auto daub option by default that will automatically mark the numbers that are being called out on each of your bingo cards or if you want to have the real feel of a bingo hall you may select the manual daub option that will give you the opportunity to mark each of the cards yourself. Once a full row of numbers or required pattern has been covers depending on the bingo variation, you win the game. There is also no need to call bingo when you win with online bingo, as the winner is announced automatically and the winnings get credited to your account without any human intervention. As you will notice Online Bingo gives you the chance of playing bingo in the comfort of your house or anywhere you want and it is not prone to any human errors, thus allowing you to have the best possible experience of a bingo game.